A simple way to get toddlers using a knife today from us. I don’t know about anyone else but getting J to use a knife is a little scary for me – he has a respect for scissors “Scissors are sharp Mummy” is all I hear when we get them out – but knives are new to him – however as he gets more into the “I Do’s” he wants to take more control of his life and one of those things is with his meals so we need to work on using a knife. I used some of my white homemade play dough that I made back in the winter and still going strong – with a small portion I coloured it yellow using food colouring and the rest I left white – you could easily use store brought play dough. To make the eggs I put a small ball of yellow in the middle of a large flat piece of white and then wrapped it around rolling it in my hands to an egg shape. (Next time I am putting them inside some plastic eggs that I’ve brought today and also in an egg box for J or even using an egg cup with him to add a little element of role play). Because J had no idea what to do with the “eggs” I modelled with one using his toddler knife and our small plastic play dough knife cutting it up to reveal the yellow yolk in the middle. Because the knives are blunt and toddler hand size they are perfect for toddlers to practice on – it was great to see him initially use a sawing motion, and give up and pull them apart – yes the first few times that really happened but the more he played the better he got – we’re working on it and it’s doing something that he really enjoys which is great. 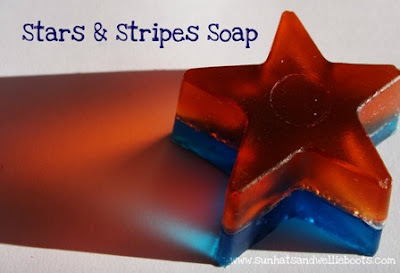 It’s another Tuesday which means another Tuesday Tots (do the weeks seem to be going really quickly for anyone else) and this week I’m featuring Sun Hats and Wellie Boots Stars and Stripes Soap – I’ve got a soap making kit and being meaning to experiment with it further than what it says on the instructions and this may just be the inspiration I need. Please feel free to grab the Featured on Tuesday Tots badge from the side bar and I can’t wait to see more ideas this week. Now for this weeks linky – as normal is for any post about under 5’s – whether it’s a craft, activity, play idea, recipe, proud moment or advice you’re welcome to link up. Growing a Jeweled Rose are co-hosting and we would love for you to link up 1 or many posts this week. I also ask that you grab the Tuesday Tots badge from the side bar, and either add it to your blog or include it in your post through a text link back to Rainy Day Mum (or Growing a Jeweled Rose if you are linking from there). Also, just a reminder. Linking up gives Growing A Jeweled Rose and Rainy Day Mum permission to feature and share your post via several social medias, including Pinterest. If being featured, we may also grab a photo from your blog for use in the post but of course will link back to your site. What an adorable egg idea and great use for practicing cutting skills. We spend a lot of time talking about knife safety with our Little Hands that Cook with Books lessons. They have all become very good at cutting. Ohhhh bananas would be a good idea to practice with as well – we don’t have string cheese and I’m the only one that eats cheese in the house! I really love this activity! Such a creative way to practice cutting! Love the play dough eggs! Such fun way to practise cutting. What a really good idea. My little boy keeps putting the knife in his mouth. Oooh what a great idea. My kids LOVE using knives (don’t worry, no sharp ones). Love the playdough egg! I have let all my children use knives at very young ages. My youngest is now five and I don’t have any problems letting her cut cucumbers with very sharp knives. I believe if you teach kids they can be very responsible. This is a great introduction activity.